Oil markets are generally higher this morning, supported by Nigerian oil production instability. Oil prices saw large gains (71 cents, or 1.3%) on Friday thanks to threats of strikes from the Nigerian union of works. Prices are continuing their gains this morning, though so far gains have been limited to just 14 cents (0.2%). Crude prices are trading at $57.50 this morning. 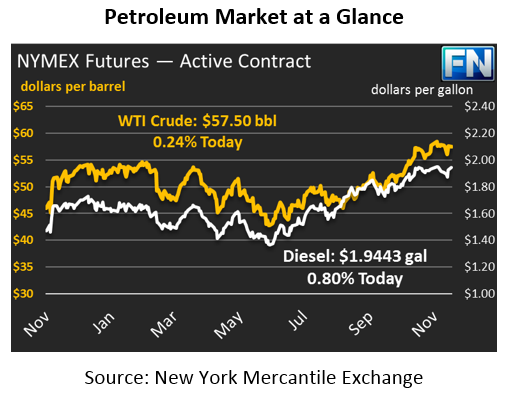 Fuel prices have seen similar movement, with large gains on Friday continuing into this morning’s trade. Diesel prices picked up 3.5 cents (1.8%) on Friday, with prices closing the day back above the $1.90 level after trading lower on Thursday. Prices are continuing their gains this morning, with prices currently up 1.5 cents (0.8%) to trade at $1.9443. Gasoline saw smaller gains on Friday, with gains held to just 1.9 cents (1.1%). Gasoline is maintaining the trend, with prices today rising by a meager 0.2 cents. Prices are currently trading at their highest level in a week, at $1.7181. The CFTC reported this week that net speculative length fell slightly, though remains near record highs. Such a strong build-up of trading positions often precedes falling prices; more trading demand for crude oil is unlikely (though possible). Check out our article from last week on the importance of CFTC data. Markets continue to fixate on Nigerian production, as threats of union worker strikes put output in jeopardy. The worker strike could have a nationwide impact on production, potentially taking barrels off the market during a time of rising demand. The labor union, PENGASSAN, has a mixed history of coming through on threats, but last May flexed their muscles in a three-day strike on nationwide production. Markets must assume the latest threats are credible and trade cautiously until the issue is resolved. On the OPEC front, Goldman Sachs estimated today that OPEC compliance rose to a record high 132% last month. Production from the organization has been strictly controlled, unlike U.S. production, which GS estimates will rise by 780 kbpd in 2018. Non-OPEC production excluding the U.S. will be 550 kbpd in 2018, giving a total Non-OPEC production increase of 1.33 MMbpd in 2018 – offsetting OPEC’s production cuts and keeping markets balanced. Several major organizations will publish their monthly updates this week, which will give more insight into expectations for 2018.